Thermostats are very useful devices to control your home's temperature. Not only do they keep you and your family comfortable by maintaining the room temperature at a certain preset level—they also save you money on your heating and/or cooling costs. Since your system only turns on when the temperature falls below or rises above a certain level, it doesn't have to run all the time. This can save you up to 30 percent of your usual heating and cooling expenses. A thermostat also saves you the trouble of having to adjust your system directly whenever you want to change the room temperature. Read our Thermostats Information Page for more information about the different types of thermostats and how to install them. Programmable thermostats are the ultimate in efficiency and comfort. They can be set to specific temperatures for weekdays and weekends, to fit your schedule and lifestyle. Automatically turn down or shut off your system when you're away from home. Have it turn itself back on just before you come home so you walk into a warm house. Have it turn itself down just after you fall off to sleep to save money on your heating bills. 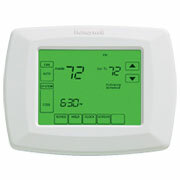 We offer programmable models from Honeywell, a leading manufacturer. Our manual easy-to-use thermostats are a great value for those on smaller budgets who don't require a programmable unit. They're available in either the more traditional round dial models or the more modern design with digital readout. Find out how using a thermostat can save you up to 30% on heating bills! Standard Non-Programmable thermostats offer simple, efficient temperature control in a sleek rectangular design with easy-to-use slide levers and switches. Honeywell Electric Heat Thermostats are specifically designed for accurate and comfortable control for baseboard heat systems.